It’s a time of celebration for our partnership as our newest doctors take their oaths and prepare for their residencies. Eight of these physicians will conduct their residency training in Spokane, and along with their colleagues will carry forward what they’ve learned in medical school as they serve patients in communities near and far. We’re also happy to announce that all of our incoming medical students not only listed Spokane as their first location choice, but that we have also had to create a list of alternates. Both of these are firsts for the UW School of Medicine in Spokane and together are a fantastic testament to the high quality medical education students know they’ll receive here. We know that the accomplishments of our students are due to their hard work and determination, as well as your support. Whether by mentoring a student during a clerkship or clinical rotation, or simply by attending one of our events, please know that your support is deeply appreciated. 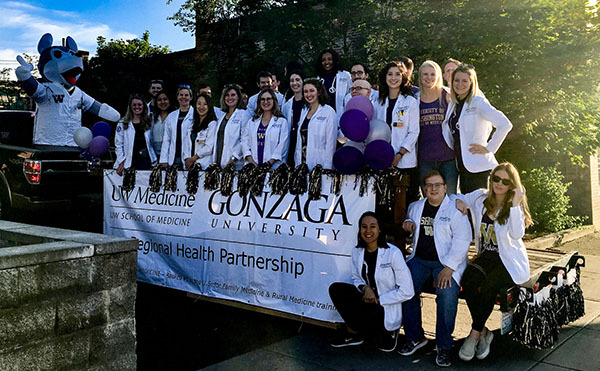 Summer is often thought of as a time for students to relax, but for UW School of Medicine students studying on Gonzaga University’s campus, summer is full of activities central to their journey to becoming physicians. This summer, first-year students will spend much of their time advancing their knowledge and experience through lectures, studies and practicums with community physicians. Meanwhile, third-year students are continuing their required clinical rotations alongside practitioners in the community. 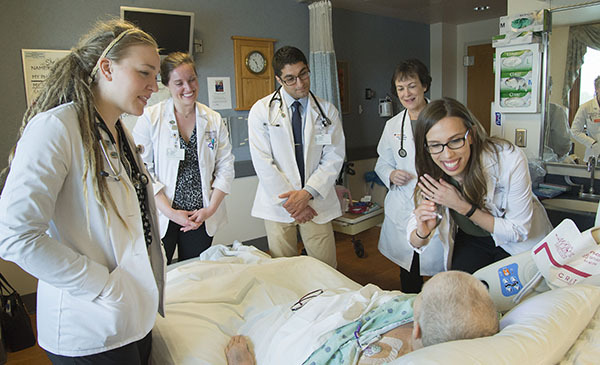 During rotations, students actively participate in patient care under the supervision of physicians and residents at teaching hospitals, gaining valuable hands-on experience. The students will complete required clerkships in many different specialties in both the hospital and clinic setting where their exceptional skill and enthusiasm shine. It’s a season of milestones for our medical students. On May 25, 35 fourth-year students who began their medical education in Spokane participated in the annual Physician’s Oath & Hooding Ceremony, marking their graduation from medical school. Faculty mentors placed doctoral hoods on each graduate, signifying their success in completing the graduate program and marking their transition to residency training. This ceremony came on the heels of Match Day, held on March 16, which is one of the most exciting days in medical school. After months of interviews and applications, 14 fourth-year students who completed most of their clinical training in Spokane were matched with their residency programs. We are especially pleased that eight of these new doctors will be conducting their residency training in Spokane. 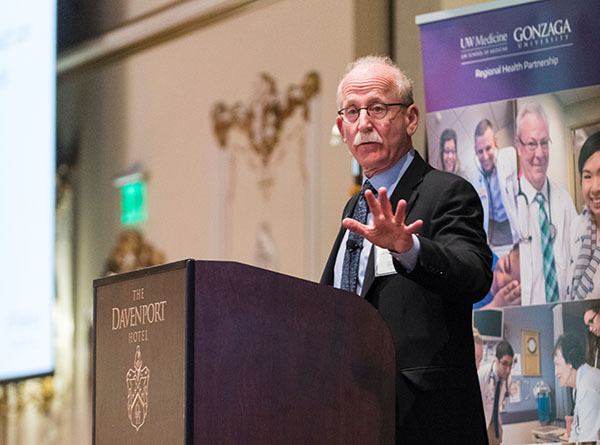 More than 350 students, clinicians, community leaders and local residents gathered on April 19 to hear David Tauben, MD, chief of pain medicine at the UW School of Medicine, discuss the opioid epidemic. Dr. Tauben, who is also a UW clinical professor in the Departments of Anesthesiology and Medicine, shared sobering statistics of opioid abuse in the U.S., including that more than 16,000 people die from opioid overdose each year. He also spoke about the variety of alternative methods to control pain, including mindfulness, exercise, acupuncture and sleep restoration, as well as offering clear clinical priorities for the appropriate use of opioids for pain management. Tauben also shared insights into new regulations in Washington state that go into effect in January 2019 to curb the abuse of this highly addictive substance. You can watch the lecture on TVW. While in Spokane, Tauben also met with students and faculty from both institutions, and well over 100 community physicians, to discuss pain management and the opioid epidemic. The event was the second Next Generation Medicine lecture presented in Spokane by the UW School of Medicine and Gonzaga University, and was sponsored by local health organizations Kaiser Permanente, MultiCare, Providence Health Services, the Spokane Regional Health District and the Spokane County Medical Society. The next lecture in the series is planned for the fall and details will be announced soon. This summer, 32 medical students will spend four weeks working with local physicians in underserved communities throughout eastern Washington, Wyoming, Alaska, Montana and Idaho as they learn about the health challenges faced most acutely by rural communities. Their research is coordinated through participation in the Rural/Underserved Opportunities Program (RUOP), a four-week immersion experience in community medicine for students between their first and second years of medical school. RUOP provides early exposure to the challenges and rewards of practicing primary care medicine in rural or urban underserved settings, and promotes a positive attitude toward community medicine. Through interviews and a demographic analysis, each student will identify a public health problem and examine the issue within the context of their RUOP community. By conducting research they will determine what interventions have worked in similar communities and, with guidance from community members, will translate their findings into a culturally appropriate and feasible local community health plan. They and students from Gonzaga will then share their findings with community stakeholders and the public at the Regional Research Poster Session, to be held at Gonzaga on October 23. 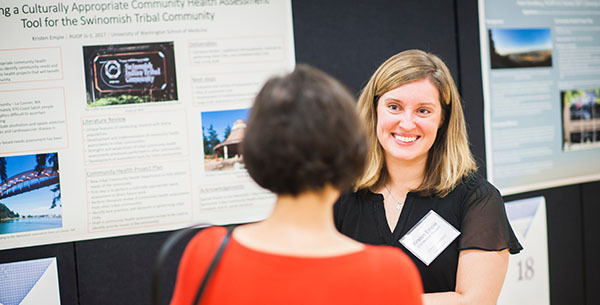 The UWSOM-GU Regional Health Partnership hosted Vision 2030’s Graduate Medical Education Summit on May 21, bringing education, community and health care leaders together to discuss ways to support the residency portion of medical education. Four recent medical school graduates shared insights into what makes Spokane a great location to start and build a medical career. Among the area’s strengths: strong training and education, excellent practitioners interested in teaching, big city amenities with a lower cost of living, a growing mass of students and providers, and employment opportunities for spouses. The challenges: restrictive non-compete clauses, excessive debt (requiring high salaries) and hard-to-find alternatives. Vision 2030 is committed to continued awareness-building discussions and collaborations to help address these issues and ensure Spokane and Eastern Washington expand opportunities for resident physicians. Medical students took a break from their studies to participate in Spokane’s 80th Annual Lilac Festival, staffing a float in the festival’s Armed Forces Torchlight Parade.